Cladirile ELI-NP au fost finalizate in anul 2016 si sunt functionale in integralitatea parametrilor proiectati, avand toate autorizatiile de functionare si indeplinind toate conditiile tehnice si legale pentru gazduirea și asigurarea muncii echipelor tehnice si stiintifice si a operarii tuturor echipamentelor. We had the honour to welcome an important scientific delegation from France. 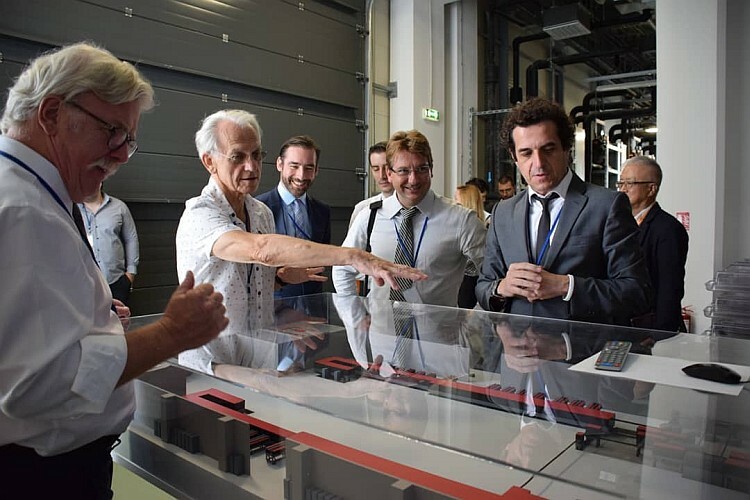 Prof. Gerard MOUROU (Director IZEST, Ecole Polytechnique Haut College), Prof. Benoit DEVEAUD (Director of Research Ecole Polytechnique), Prof. David ROS (Director Laboratory LaserX University Paris Saclay, Mayor of Orsay) had the opportunity to find more about the "Implementation status of the ELI NP project" due to a presentation made by Acad. N.V.Zamfir. 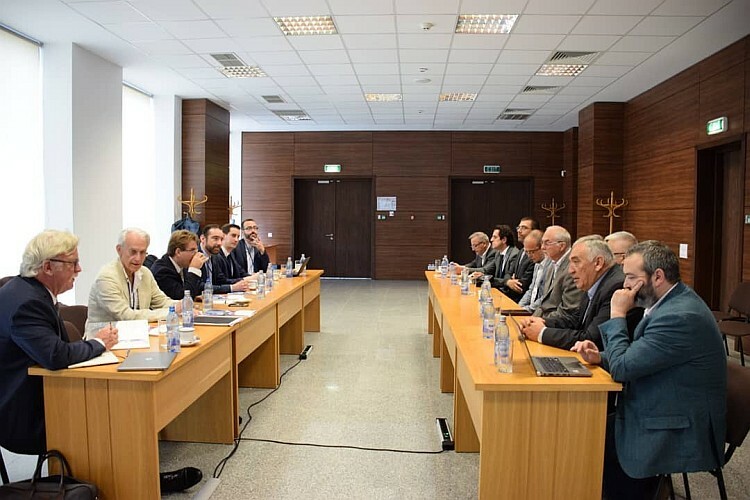 During the discussions Ioan Dancus offered information about the "Current status of the High Power Laser System", Dan Stutman talked about the "Curent status pf the Laser Nuclear Physics Experiments" and Daniel Ursescu provided some insights about the "Collaboration on the Pulse Compression". We want to inform you about the upcoming workshop on "Energy for Sustainable Science at Research Infrastructures" which is to be held at the Extreme Light Infrastructure ELI-NP in Magurele, Romania, on 23/24 November 2017 (http://www.eli-np.ro/4ess/). CERN, ESS and other research laboratories within the European Association of Research Facilities ERF are organizing this workshop on energy efficiency and sustainability issues at large-scale research infrastructures. The workshop has a broad participation from stakeholders from large research infrastructures and is the fourth one of a regular workshop series on this theme. One of the goals of the workshop is to identify the challenges and to exchange best practice regarding energy/power efficiency and optimization, solutions and implementations as well as to review the opportunities of potential future technical solutions suitable at research infrastructures. Thus, the sessions at the workshop will focus on energy/power management at research infrastructures, energy efficiency examples at research infrastructures and in computing centers, sustainable campus development and management, energy quality and operation as well as clean technologies developed at research infrastructures. More information and the current program is available at http://www.eli-np.ro/4ess/. Enter the future Extreme Light Infrastructure in Magurele, Romania. This facility will not only provide the polarized gamma rays Koga proposed, but will make some of the brightest gamma rays in the world. This is important because just like a brighter ambient light can shorten the exposure time for taking a photo, a brighter gamma ray can shorten the run time for Koga's proposed experiment. Kazuo Tanaka, the scientific director of the Nuclear Physics division of the future facility, is pleased with Koga's team's proposal. "I think their proposal is very crystal clear. They calculated how many days of shooting they need for the experiment, and came up with 76 days," he said. "I think if they do the experiment we can have a very definitive measurement for Delbruck scattering." Full article at Inside Science. On December 19-20 took place the first editon of the ELI-NP Young researchers competition, consisting in scientific presentations, held by 24 young researchers, related to their activity at ELI-NP. The competition addressed two sections: Postdoctorals and Ph.D. students. Silver Prize -	Ozgur Culfa (RA3), with the presentation: Hot Electron Production in Laser Solid Interactions with a Controlled Pre-Pulse. Silver Prize - Constantin Dragos Popescu (RA3), with the presentation: Submillimeter targets positioning in High Power Laser experiments at ELI-NP using optical measurements and kinematic models. The prizes were handed over by Acad. Nicolae Victor Zamfir, ELI-NP Project Director, and Prof. Dr. Kazuo. A. Tanaka, Scientific Director of ELI-NP, in a ceremony that took place on December 21st, following the session of presentations held by ELI-NP Directors and Heads of RAs on the ELI-NP activity results in 2016. The Extreme Light Infrastructure project (ELI) is close to the transition between the construction and the operation phases. ELI will be the world's first international laser research infrastructure, pursuing unique science and research applications. To strengthen and further broaden ELI's partnerships, the 2nd Partners Meeting was held in Romania on 16-17 November, and was hosted by ELI Nuclear Physics, the Romanian pillar of ELI. The event was dedicated to the presentation of the progress in the implementation of the project to present and prospective Partners and future Users of the ELI-European Research Infrastructure Consortium (ELI-ERIC). During the two days, the participants could hear during intensive and fruitful exchanges about the status of the ELI-ERIC application, the user access policies and got an overview about the construction status, the equipment available at the three pillars and the plans for first day experiments. The parallel implementation phase of the three pillars will be substituted by a joint operation after the creation of the ELI-ERIC. According to the plans, the construction of all ELI pillars will be ended by 2019. 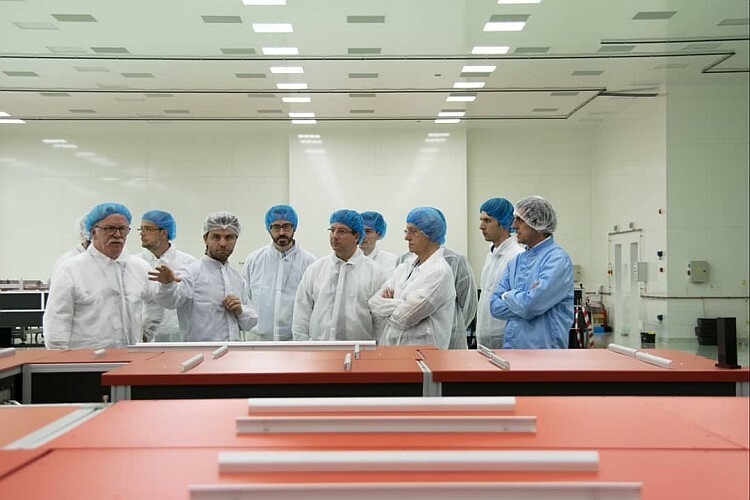 After testing and demonstration of the experimental capabilities the full operation can start from 2019-2020. The access policy to ELI intends to ensure the attraction of the best scientific users and the generation of excellent scientific results - Prof. Carlo Rizzuto, Director General of ELI-DC, said. He also emphasized that research is not an economic activity, so instead of speaking about business, in this environment is probably better to speak about sustainability. The sustainability should be secured by having excellent quality of its capabilities and its 'service', allowing the national and international research communities to commit the participation of their governments - said Prof. Rizzuto. Besides the implementation and ERIC achievement status, the representatives of present members of ELI-DC and of potential members of ELI-ERIC, presented the membership status and the possible ideas of partner facilities in their countries. France, Lithuania, Germany, Switzerland, the UK - are some examples of the countries that are interested in ELI. These partnerships can involve not only performing experiments, but also joint technological development, training and 'mind-sharing' as well. The completely new research opportunities offered by ELI might attract users from all around the world, and our aim for the future is to build up a strong ELI international user community. "New frontiers in nuclear physics with high-power lasers and brilliant monochromatic gamma beams"
On May 31st-June 1st took place the Workshop "Perspectives of ELI", organized by the Extreme Light Infrastructure - Delivery Consortium and the three pillars of the Extreme Light Infrastructure from the Czech Republic, Hungary and Romania. The event was hosted in Dolni Brezany by the ELI Beamlines. During the two intense-work days, the management of ELI-DC and of all three ELI pillars met with the prospective Partners and Users of ELI to discuss the progress over the last year and receive feedback from them concerning the ELI project's goals and challenges moving forward to the ELI-ERIC European Research Infrastructure Consortium. The ensuing discussions and animated debates represented a key point and a very useful step in the current dynamics involving the nearly completed construction process of the three pillars and their integration into a single Infrastructure through the setting-up of the ELI-ERIC. The management of ELI and the participants addressed the issue of the establishment of the framework of ELI-ERIC, how to attract users, what are the best services that ELI should offer, how ELI will build the relationship with industry, etc. The workshop stimulated the partners and users to merge their ideas, give their comments and criticisms thereby establishing a functional and passable road to ELI's future success. ELI-ERIC will be a flexible European organization, attractive and competitive at the international level. All the participants brought their contribution to a deeper understanding of the founding principles of the future open access ELI-ERIC, that can reach out more effectively to the laser community world, hopefully creating valuable scientific results as well as interesting developments in technical training and education, as well as for the industry and through this, stronger socioeconomic returns. "The results of the workshop were very good and fruitful" said Carlo RIZZUTO, Director General of ELI-DC. "There has been a lot of progress towards the future framework of ELI-ERIC. The construction of the three "pillars" of ELI nears completion (ELI-Attosecond - Szeged, Hungary, ELI-Beamlines - Dolni Brezany, Czech Republic and ELI-Nuclear Physics in Magurele - Romania). We are ready to become a joint, internationally recognized infrastructure open to the laser users community." 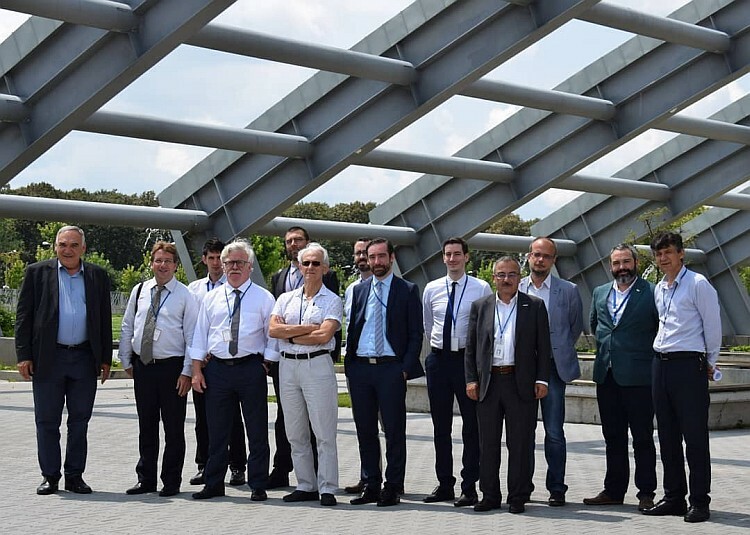 The discussions about the start-up of ELI-ERIC and of its ways to interact with the scientific and industrial stakeholders will be continued, and will help ELI and the whole European laser community to achieve novel results, which will influence the whole European Research Area, offering new perspectives in laser science and technology for the world. ELI-ERIC will be an open, distributed and service-oriented laser research infrastructure which will offer innovative services at the forefront of present laser technology to its users. ELI is setting a milestone in structuring European laser research and it will act as a center of competences, open and attracting the best researchers worldwide. The Laser Infrastructure will also boost regional investments in the host countries: Czech Republic, Hungary and Romania. Meeting with specialists of Technology and Innovation Center Sunrise Valley in Vilnius - the Laser Centre -, during the State visit President Klaus Iohannis carried out in Lithuania. The two sides talked in depth about boosting the bilateral relations in the scientific fields, with a special emphasize on cooperation opportunities in research and development with the Scientific Project ELI-NP, in Magurele. Opened in December 2014, Sunrise Valley represents the most important scientific research institute in Lithuania, founded by the Vilnius University, the Gediminas Technical University of Vilnius and leading IT, communications and laser companies. Carlos Moedas, Member of the EC in charge of Research, Science and Innovation, received Carlo Rizzuto, Director General of the Extreme Light Infrastructure Delivery Consortium International Association (ELI-DC), Catalin Miron, Deputy Director General of ELI-DC, Lorant Lehrner, Managing Director of ELI Attosecond Light Pulse Source (ELI-ALPS), Jan Ridky, Director of the Institute of Physics of the Czech Academy of Sciences (ELI Beamlines), and Nicolae-Victor Zamfir, Director of the ELI Nuclear Physics (ELI-NP) project. The JRC and the Romanian Institute for Nuclear Physics IFIN-HH sign a collaboration agreement. On 3 February 2016, the European Commission's Joint Research Centre (JRC) and the Extreme Light Infrastructure - Nuclear Physics (ELI-NP) / "Horia Hulubei" National Institute of Physics and Nuclear Engineering, signed a Collaboration Agreement in Bucharest, Romania. ELI-NP is one of the three pillars of the European Extreme Light Infrastructure (ELI) that is supported by European Strategy Forum on Research Infrastructures (ESFRI). The impressive construction site of ELI-NP was visited following the signing event. The collaboration agreement aims to support the implementation of ELI-NP, with the expertise available at the JRC Institute for Reference Materials and Measurements (IRMM). The nuclear data infrastructure at JRC-IRMM is one of the three JRC infrastructures connected to ESFRI. The agreement will promote and strengthen transnational access to both organizations and will start with four well defined joint research actions. The content of this document does not necessarily represent the official position of the European Union or of the Government of Romania.